My children have discovered the joy of sending and receiving mail. Sure, it sometimes involves mailing things to themselves but that does not take away from the magic of crafting a letter, walking to the post box, posting the letter and awaiting its arrival in our mailbox. Style your outgoing mail with personalised stamps and I promise you’ll have no shortage of helpers – I don’t think I have ever met a child who is not instantly attracted to an ink pad! There are many sweet name stamps for children. High on my list of favourites is the beautiful range from Imprintables, reviewed here before. Also take a look at the cute little collection at My Retro Baby – with so many designs to choose from, you are bound to find one that suits your child. Each stamp is personalised with your child’s name and cost US$24 each. If you are looking for an address stamp that will make your family stand out, the vintage press look of Inkorporated designs will certainly put a unique seal on your mail – I love the Frank Lloyd Wright inspired stamp (shown above) but appreciate the fun in the ‘saloon’ style print (shown at top). 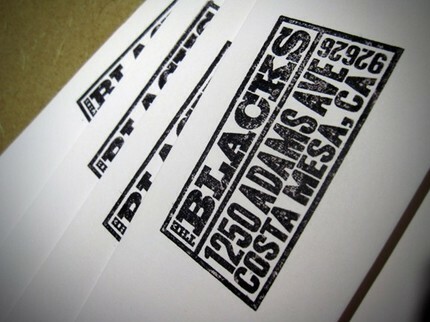 Inkorporated stamps are US$18 each. For something modern, Stamp Out Online has an enormous selection in unusual shapes. I like their simple circle designs (above) but there are lots of other fun choices. Prices range from US$12.99 to $32.99. Rubber Stamp Press has some exceptionally beautiful stamps from simple but elegant address stamps to delicate flowers and dinky bicycles (above). Pick out some favourite designs and then drool over their enormous range of coloured ink pads – there are over sixty shades to choose from including apple green, canary yellow and peony pink. Prices for stamps range from US$19.95 to $29.95 and ink pads are $5.95 each. Lastly, for kids that just love mail and all that goes with it, have fun with the Kikki K Love Mail stamp set – apart from sealing everything with love, kids will enjoy the authentic looking postmarks and airmail stamps. 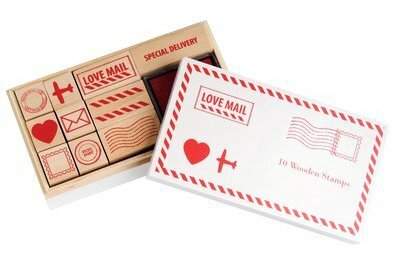 The Love Mail Stamp set is $24.95.